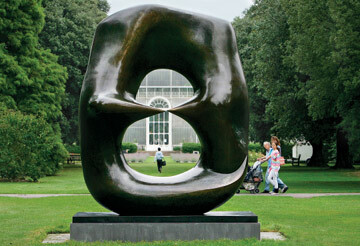 Henry Moore once said that "sculpture is an art of the open air." That's certainly true about his sculpture, all those massive blobs of bronze sunning themselves in plazas all over the world. Moore wanted his art, especially the monumental work that dominated his output after World War II, to be seen outdoors, in primal settings that bring out its kinship to the mineral fundaments of the earth itself.